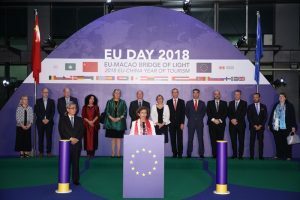 Macao (Macao SAR) – May 9, 2018 (travelindex.com) – The Global Tourism Economy Forum (GTEF or the Forum), an official partner of the 2018 EU-China Tourism Year (ECTY 2018), coorganized the EU-Macao Light Bridge illumination ceremony with the European Union (EU) Office to Hong Kong and Macao at Sai Van Lake Square this evening (May 8) to celebrate Europe Day as part of the ECTY 2018, and the 25th anniversary of the establishment of the EU Office to Macao. The city’s landmark Macau Tower Convention & Entertainment Centre (Macau Tower) was illuminated in blue, the colour of the EU flag, representing a symbolic bridge of light connecting with the EU. The ceremony was officiated by Ambassador Carmen Cano, Head of Office of the European Union Office to Hong Kong and Macao, and Mr. Wong Sio Chak, Acting Chief Executive of Macao SAR and Secretary for Security of the Macao SAR Government. Mr. Ho Hau Wah, Vice Chairman of The National Committee of The Chinese People’s Political Consultative Conference (CPPCC) and Chairman of GTEF, Mr. Yuan Hengge, Deputy Commissioner of the Ministry of Foreign Affairs of the People’s Republic of China in Macao, Mr. Ho Iat Seng, President of Legislative Assembly of Macau Special Administrative Region, Ms. Pansy Ho, Secretary-General and Vice Chairman of GTEF, the Consuls General and trade commissioners of the EU Member States to Hong Kong and Macao, Macao SAR government officials, Professor Kit Thompson, Chairman of The Macau European Chamber of Commerce, Mr Rutger Verschuren, Chairman of the France Macau Chamber of Commerce, Mr. Tony Un, Chairman of the German Macau Business Association, and tourism leaders were among the attendees of this special event. The EU-China Light Bridge, one of the many exciting ECTY2018 events, is a collaboration among the European Commission, the European Travel Commission (ETC), numerous municipal councils, cultural institutions and tourism boards in Europe. More than 50 landmarks, iconic sites and venues across 18 EU countries, namely Austria, Belgium, Croatia, Denmark, Estonia, France, Germany, Hungary, Ireland, Italy, Malta, Portugal, Romania, San Marino, Serbia, Slovakia, Spain and the United Kingdom took part in early March, coinciding with the celebration of the Lantern Festival in China. Participating sites were illuminated in red to form the EU pillar of the Light Bridge. Macao was the first Chinese city to celebrate ECTY2018 with a bridge of light from the Macau Tower. Thirty other cities and sites, such as Beijing’s Badaling Great Wall, Summer Palace and Bird’s Nest, Shanghai’s Oriental Pearl TV Tower, Hubei’s Yellow Crane Tower, Sichuan’s Qingcheng Mountain and Dujiangyan, and Hong Kong’s Tsim Tsa Tsui Clock Tower, will be illuminated in blue on Europe Day on 9 May. Following the successful illumination ceremony at the Macau Tower was a dinner hosted by GTEF at MGM COTAI, the venue of GTEF 2018, with a presentation of the Forum to the EU counsel generals and representatives. As an official partner of the ECTY 2018, GTEF 2018 will be held in MGM Cotai on October 23 and 24 under the theme “Strategic Partnership in a New Era, Rising Momentum for a Shared Future”, and will showcase the EU as the Partner Region. GTEF 2018 will also present Guangdong Province as the Featured Chinese Province with a special focus on the Greater Bay Area. Pioneering topics at the top of the public-private agenda, and dedicated to creating tourism promotion, investment and cooperation opportunities for tourism stakeholders, GTEF will use its pragmatic tourism exchange platform to drive discussions on strengthening EU-China commercial and cultural exchanges, and to provide opportunities to build EU-China cooperation and partnership through bilateral trade meetings, business matching, networking, workshops, exhibitions, etc.